(a) Align the markings on the roof headlining assembly with the No. 14 roof silencer pad and install the silencer pad using hot-melt glue as shown in the illustration. (a) Install the No. 1 roof wire. (b) Turn the visor connectors clockwise approximately 90° to install the connectors to the roof headlining assembly. (c) Apply adhesive tape to the locations shown in the illustration. As shown in the illustration, line up and secure the reference tape of the wire harness to the tip of the roof headlining assembly. (a) Align the markings on the roof headlining assembly with the 2 No. 2 roof silencer pads and install the silencer pad using hot-melt glue or double-sided tape as shown in the illustration. (a) Align the markings on the roof headlining assembly with the 3 No. 3 roof silencer pads and install the silencer pad using hot-melt glue or double-sided tape as shown in the illustration. 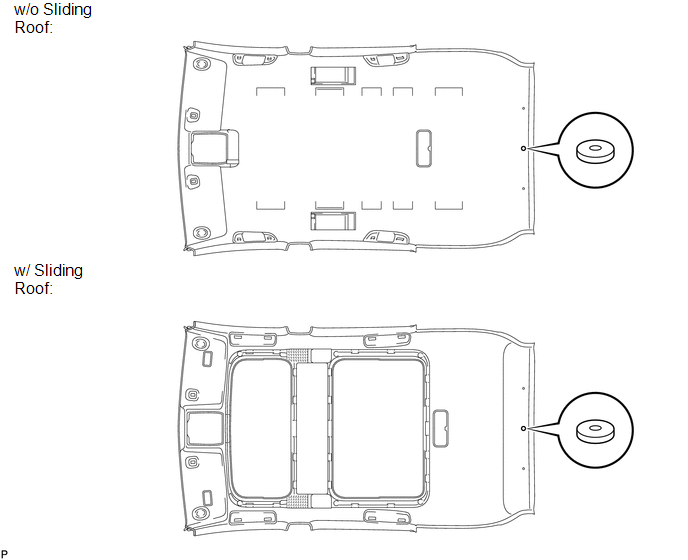 (a) Align the markings on the roof headlining assembly with the roof side rail spacer LH and install the spacer using hot-melt glue as shown in the illustration. (a) Install the vanity light assembly (See page ).